Our rekindled love for old china and vintage tea parties, baking, sugar, spice and all things nice have brought Miss Tea Time to life. I love painting everything to do with the glorious hour known as Afternoon Tea. The visual beauty of a shiny sweet wrapper, the faded pink and gold on a box of rose petal truffles, or the iced frosting on a fairy cake is so seductive to me. 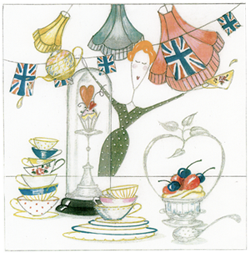 Miss Tea Time is available for packaging design for baking, confectionary, foodstuffs and related products including cutters, colourings and decorations, also greetings cards, wrap, invites, scrapbooks etc. A series of stories for a lavishly illustrated book is underway. 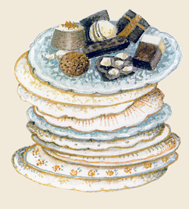 I am also seeking the opportunity to illustrate a book on baking utilising Miss Tea Time's passion for scrumptious detail and lashings of delicate colour, depicting detailed scenes of bright utensils and cookware, china, fabrics and of course food – a complete world of culinary delight.